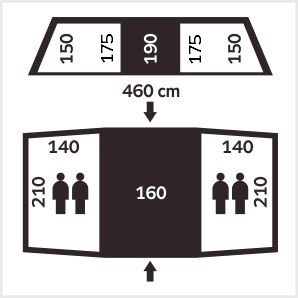 Very-lite two-entrance double-sheet four-man family dome tent with a rectangular floor ground-plans of two inner tents and with the large vestibule between them. It is suitable for ordinary camping & outdoor activities. The inner tents are sewn with the floors and are hung from the inside of the outer tent (flysheet). The vents at the top of the inner tents is covered with airy & dense mosquito-net. The airy & dense mosquito-net in entrances enable better ventilation & protection against small insects. The flysheet is hung on the frame poles with help of sleeves and attached to the poles ends using elastic webbings. In front of the inner entrances is the very large vestibule which can be used both for storage of an equipment and for cooking (with caution). It is possible to create a shelter against the sun and mild rain from the flysheet doors using the enclosed black iron props. It is possible to guy a tent with help of numerous fixing points of flysheet. There are air vents at the top of flysheet. 1. Hang the inner tent, if it is not suspended, on the inside of the flysheet (outer layer) using the olives. 2. Put the tent by floor underfoot. 3. Insert the compound ALU poles (it is good to check all connectors fully engaged into tubes) through the sleeves (short gold poles across the tent and long silver poles along the diagonal of the tent) and put the ends into the inner eye-lets of the appropriate webbings. 4. Fix the corners of the inner tent with help of elastic webbings to the ends of the poles. 5. Stretch and anchor the edges of the flysheet with help of the tent-pegs. 6. Tense the the flysheet walls with help of handles and guy-ropes & pegs. 7. The door can be opened vertically and it can create a shelter with help of the black props (anchored at the tips of the props by long guy-ropes). Packing of the tent is done in reverse way.